Have you felt it, too, that rapid, sometimes painful limping toward this day? It’s Christmas Eve. In my world that means Christmas has arrived. Traditionally, today we rest and enjoy togetherness. We make pine cone-peanut butter-birdseed ornaments; we take them to the local reservoir, where we walk the dogs, the kids, ourselves, for an hour, making our way round to the tree where the locals leave ornaments. We’ve taken this walk every NorCal year except one, when the rain prohibited a long walk with littles. Then we lunch, or really, snack, while we make dinner for this evening and prep ingredients for tomorrow’s meal. We will clean up and dress up, put the presents under the tree, and make our way to church to solidly put our focus on the One who is the Hope of the world. We will embrace friends and extend good wishes and revel in gratitude for this good life God has given. We will pray for those who hurt, who are cold or lonely, who need an infusion of the hope only He can provide. We will have dinner together, a simple meal of soup and salad, before the kids get two presents. Two, because one present is always cozy Christmas pj’s they will wear tonight and wake up wearing tomorrow. Tomorrow I will take pictures of kids in Christmas pj’s, holding their Christmas stockings under the Christmas tree. It’s a tradition. This year, however, this day will not be as restful. Presents aren’t wrapped. Grocery shopping fell to the wayside of other activity. And how did this happen? We ran out of Christmas cards! We still have too many of last year’s cards, but no, I will not mail out last year’s card a second time (I did think about it. Would anyone notice? Oh, well, maybe they’d notice the gold embossed “2013”). It’s not how I like to do this day, but things haven’t gone according to plan. Teen, who woke at 5am and rode his bike across town to go fishing, just wished us a “Merry Christmas!” He is happy, and that’s something. Emmanuel, God with us, comes to make His home with us in this sometimes chaotic life. He will be our light, our joy, our hope, today and forever. Merry Christmas! Candle lighting: Light all the candles. Read: Jesus said, “I am the light of the world. Whoever follows me will never walk in darkness, but will have the light of life.” The first candle represents the hope of Israel. The second candle represents the hope of heaven. The third candle represents the hope of His coming. The fourth candle represents the hope of salvation. 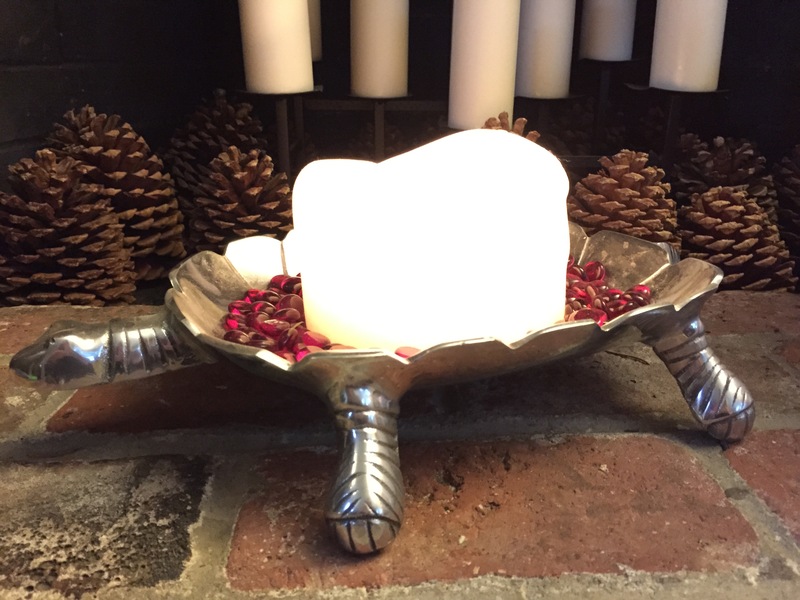 The center candle represents the hope of the world, God’s gift of His Son, Jesus Christ. Jesus, the Word of God and the light of the world, was with God in the beginning. Through Him, God created everything we see and experience. True life, true light that stamps out the darkness, is found only in Him. God sent His one and only Son to us, for our salvation, to be the hope of the world. Jesus our Savior made His home among us so that we can be at home with Him forever. Pray: Dear God, thank you for the gift of your Son, Jesus Christ. Open our eyes to see His light. Open our hearts to receive Him. In the name of Jesus we hope and pray, Amen. Three issues: increasing age and maturity; a sentimental-pack rat soul; and the furniture and layout just weren’t working. The convertible crib-daybed-full bed frame cracked some time ago. The remaining headboard, unattached, banged against the wall each time he rolled over. The drawers for the coordinating changing table-dresser stuck. Both pieces were more than sixteen years old, hand-me-downs from his brother. His rug, another hand-me-down, had belonged to an older friend who outgrew it, a cityscape “drive-your-Hotwheels here” rug. As our house doesn’t have a coat closet, our winter coats occupied half of his closet. His own coats never made it to the overly-crowded closet, so they took up valuable floor space. He had WAY too much stuff in the small space, and no good organizational system. 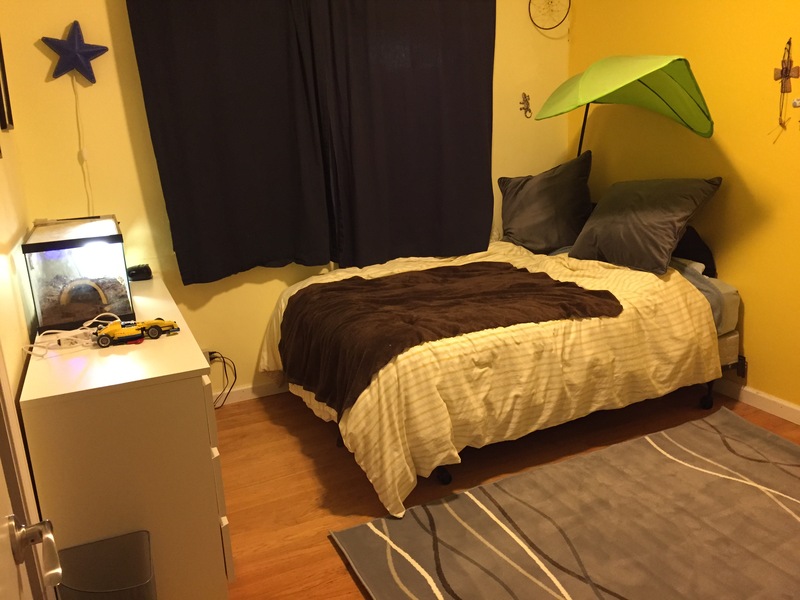 Our Christmas gift to him: a room re-do. We took him shopping on Saturday to buy a new dresser, shelving units, rug, pillows to sub for a headboard, and curtains for his closet. But we hadn’t really calculated how two hours of furniture shopping would equal exponential hours of clean-out. We boxed and bagged up most of his stuff and piled it on the living room rug. Dad spackled, sanded, and touch-up painted the walls. We sorted “Keep” and “Give away”s. We vacuumed the dust bunnies that multiply behind and under furniture. We wiped down the old furniture, assembled the new, stuffed the pillowcases, rolled up the old rug and rolled out the new one. Less than five hours of work, over two days, and we have so much more to do before we’re done. My laundry baskets currently hold a) enough Nerf guns for a neighborhood army and b) a small library of books that don’t fit his bookcase. Both baskets – and so much else! – currently reside in the garage, our own Land of Misfit Toys. I considered taking “during” pictures, but honestly, didn’t want to remember the overwhelming and fairly disheartening chaos. For now, we’ve hit the Pause button. Shelving units and additional stuff-sorting will happen slowly, over weeks, but I can’t handle More this close to Christmas. Besides, I’m pretty sure he won’t miss most of the stuff in the garage. 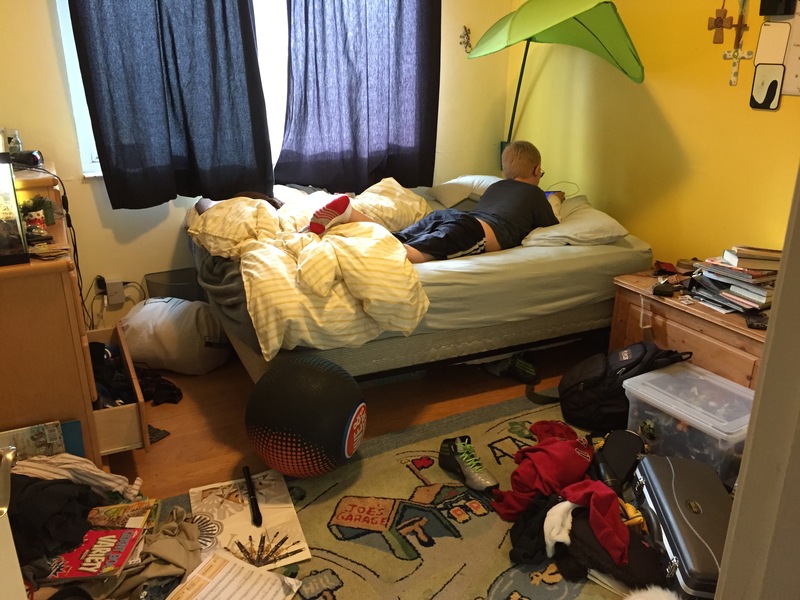 Tween had made a mess of the “broken system” that had been his room. It took expensive and hard work, more than he could manage on his own, to save him from himself and restore order and peace to his world. In short – and yes, an admittedly poor analogy – Tween needed salvation. Sin broke the world God created. Humankind has done a bang-up job of wrecking the good place God made to be our home. We needed God to step in, to pay the price and do the work we couldn’t do for ourselves. Tween (and we) have hours of sorting and assembling yet to go. He will then have to hang his jackets, put away his clothes and toys, make his bed. We made it possible, but he will have work to do, no more excuses. Before it did feel (at least a little bit) hopeless. Now we are hopeful. And it feels good. Candle lighting: Light the four perimeter candles. Read: Jesus said, “I am the light of the world. Whoever follows me will never walk in darkness, but will have the light of life.” The first candle represents the hope of Israel. The second candle represents the hope of heaven. The third candle represents the hope of His coming. The fourth candle represents the hope of salvation. This week we celebrate the birth of a baby born to be King. Mighty kings and small children together bow before Him in worship. God promised that this baby will be a good Shepherd and a strong Ruler, bringing peace to the ends of the earth. Come and worship the hope of our salvation! Pray: Dear God, thank you that you kept your promise to send us the hope of salvation. In the name of Jesus we hope and pray, Amen. Throughout the Week// light the candle, read and discuss the daily Scripture and pray together. Monday// Psalm 42:5// What makes you feel downcast, and how can God help you? Tuesday// Psalm 65:5// What awesome or righteous deeds have you seen God do? Wednesday// Ephesians 4:4// All God’s people hope in Him. Say thank you to Jesus for your hope in Him! *Sigh of relief* The kids are off to movies and friends as I borrow a couple of quiet hours to straighten up and address Christmas cards. For weeks the house has been an explosion of Christmas detritus landed alongside, underneath, and atop backpacks, shoes and jackets, sporting equipment, and who knows whose papers for who can tell which subject? I’ve done my best to focus on the important over the pine needle rug, the piled-up dishes, the un-addressed cards. 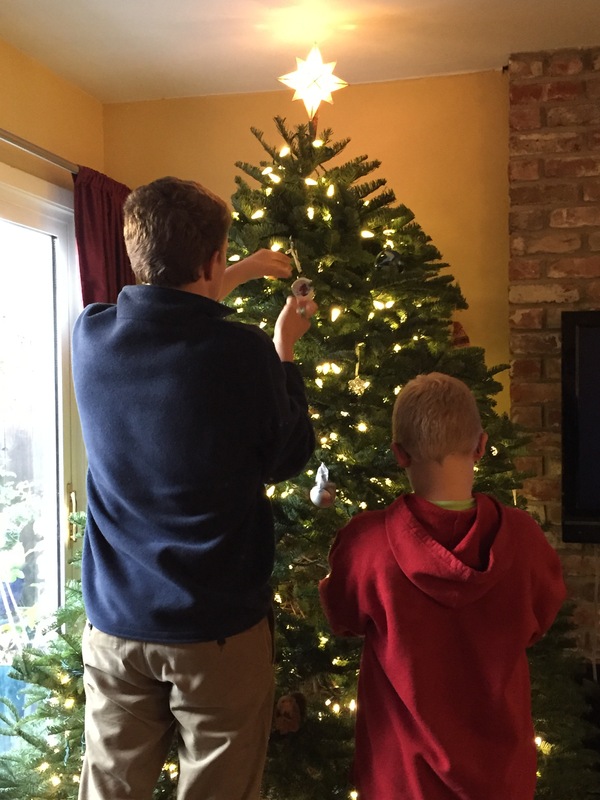 The tree was up and lit for a week before we decorated it in the one 20-minute period both boys were home between school and activities. My first waking thought earlier this week: “Even in my dreams I’m racing around!” I awoke just as exhausted as I’d hit the pillow. And then I read, “We are, as a species, addicted to story. Even when the body goes to sleep, the mind stays up all night, telling itself stories” (Jonathan Gottschall). My mind’s stories had to be of the rush, hurry, rest-less variety. 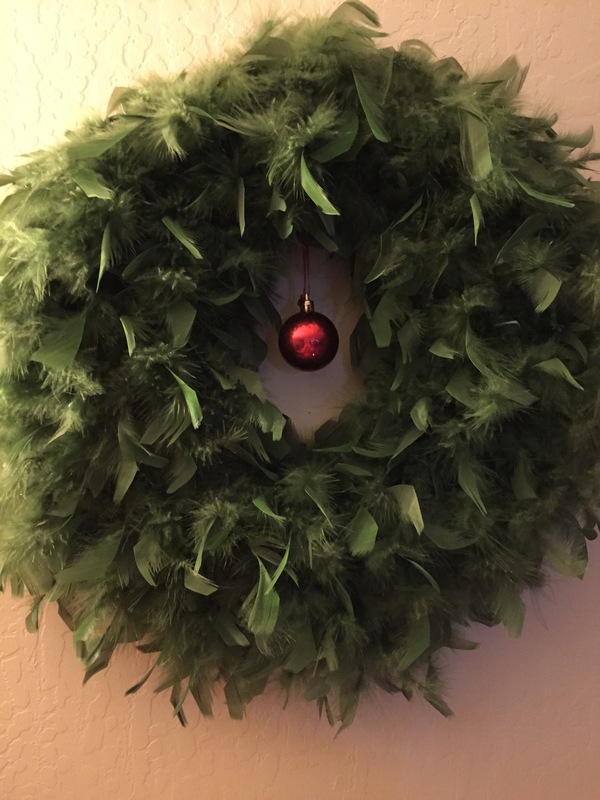 So I’ve decided in this too-full season to capitalize on my unique brand of quirky Christmas. Doesn’t everyone have a Christmas Tortoise? Not sure how it happened, but the inside base of this globe tilted while in storage. I almost threw it out last year. And then I didn’t. It’s not worth much, but I have liked it since I first spotted it. 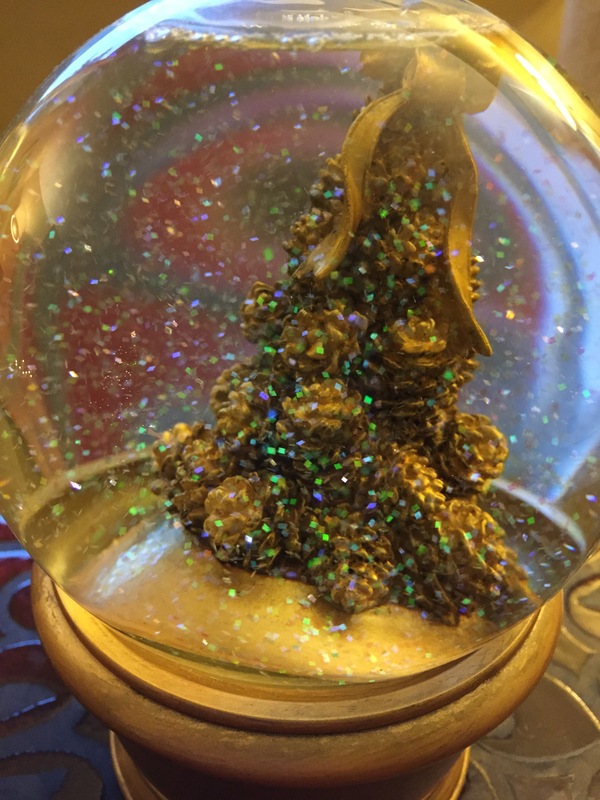 And as I held it, paused over the garbage can, I decided that this snow globe will remind me: our expectations of Christmas will always be a little sideways to the lived reality. Christmas, like life, doesn’t go according to plan. At least, not my plan. And Christmas can still be beautiful, sparkling, iridescent, even when – perhaps especially when – it doesn’t go according to my plan. My quirky Christmas decorations are talismans pointing me toward a better perspective, icons through which I experience an altogether more important Presence. They may look odd or out of place to you, but they serve a significant purpose for me. Wishing you a merry – and quirky – Christmas! We all four hopped in the car, heading to the store to buy Christmas gifts for our “adopted” little boys who live over the hill in a poor part of town. These littles, both under five years old, don’t have families of their own to buy them gifts, a fact that broke Tween’s heart so that he exclaimed, “Let’s adopt them for real! I want two little brothers!” If we could… But we can buy them some gifts to brighten their Christmas just a smidge. It’s not enough, but it’s something. Only two blocks down the road we got the call: our friend has passed. Just in time for Christmas, he’ll be singing Christmas carols with the angels this year, in the glorious presence of Jesus Christ Himself. We immediately drove to their house, the privilege and price of being both a pastor’s family and friends. We hugged and cried and sat on the linoleum kitchen floor. The two-ton tabby stepped over and around us, winding between extended hands, his soft snuggles in contrast with the jagged-broken crunch in our hearts. As directed we sent texts and emails to let others know of our dear friend’s loss, one less thing for the bereaved to do. Our kids were troopers, so sad themselves at the loss of their “local grandfather,” but willing to tell stories, to make people laugh, to give comfort in their way. Together we talked about earth time (a blink) and eternity (forever), about hope in God’s love, about God’s broken heart as He holds His grieving people. We sat together not eating through dinnertime until the Hospice nurse and then the mortician arrived. We hugged and cried some more, spoke words intended to comfort, and we left. We picked up the now-cold Chinese food we’d ordered hours earlier. We went shopping for the little boys, our big boys picking out toys and books they loved years ago. We bought big decorative gift bags to wrap these gifts, imagining the boys’ smiles. Where will they be on Christmas morning? Who will help them create Christmas memories? We went home, warmed up and ate dinner in front of a sitcom, an attempt at levity in our sadness. I didn’t sleep well. Today the sun shines silver through the white-cloud sky, a temporary reprieve from the rain reported to resume tomorrow. It’s cold. I shiver, as much from sleeplessness and sadness as from the actual chill in the air. Tears well up and recede, abiding by a mysterious tear tide chart. They’ll crash, unpredictably. More than once, I’m sure. I miss my friend, the one who never failed to greet me with, “Howdy, friend!” Whose big hug and stable, unflappable personality chuckled at our silly kid drama, who prayed for us, who modeled for my boys a life of masculine faith and commitment to family, to serving others, to loving well. Who called his wife his “girlfriend” and “sweetheart” because he intended to always woo and court this beautiful woman who won his heart so many years ago. I ache for her as she cannot imagine life without his companionship, cannot fathom coming moments of joy. Today, in this bleak midwinter, this article appears, some small balm for the brokenhearted. “Emmanuel — God with us. God with us and for us and in us and holding us and this is the Christmas miracle that outlasts all of time…. Evidence of God’s existence is cold comfort. What warms us is the wounded, weeping God who doesn’t write answers in stars – but writes His ardent love in our scars. “The miracle of Christmas is we get more than proof of God’s existence. We get the experience of God’s presence. Thank you, Father, for sending your Son to be with us, to suffer with us, to suffer for us. Thank you for pouring out your love on us, for holding us even when we can’t feel your arms of love. We need a Christmas miracle of hope in the experience of your presence. Emmanuel, we need you now more than ever. Come, O come, Emmanuel! Hope. What is it, even? Does it make any difference? But hope is more than wishing. Hope is expectancy, pregnant with anticipated reality. Hope gives us strength to muster on, to slog through the daily reality, harsh as it some days may be. Hope is whispered truth that Someone lavishes on us great riches of love, even when we feel dirt poor in life’s oozing mud. Our hearts ache this season – our family friend is dying, so unexpectedly quick. His own family prayerfully endures the momentary ups-and-downs of life’s end. Another sweet friend has a father sick, hopefully not-yet at his end. Her grandmother experienced what we can only call a miracle of complete healing. Why spare grandma, ready to go, and not dad, longing to stay? Those major life movements. And the minor – the day-to-day, home-work-school-home – movements. The daily interactions of grace and pain that linger in soft spots of thought and heart and soul. The daylong and momentary communications as we load backpacks, drive carpools, share work and lunch and work, shuffle through homework before dinner before even-more carpools before bedtime – and when was family time? Our church put on its annual Christmas concert this weekend: A Song of Hope. Hope: What is it? Does it make a difference? What makes these minor – and major – movements bearable? The presence of God, so near, so here, so With Us Emmanuel, hallelujah! We have hope because of God’s love, because of the hope God pours out on us as He lavishes His rich-RICH love, to use the “old words” – “Oh, what manner of love the Father has given unto us, that we should we called the children of God!” God is near. God is here. God loves us. We have hope. Candle lighting: Light the first three candles. Read: Jesus said, “I am the light of the world. Whoever follows me will never walk in darkness, but will have the light of life.” The first candle represents the hope of Israel. The second candle represents the hope of heaven. The third candle represents the hope of His coming. What do you want to be when you grow up? I want to be a child of God, now and forever! Think about it: how incredible that God – great big Creator of the whole world God – loves us and calls us His very own children. Just like we remain our earthly parents’ children even when we become grown-ups, we will always be God’s kids. And when Jesus returns, those who put their hope in Him will also be like Him. What a promise! Pray: Dear God, thank you for loving us and making us your children. We look forward to eternity with you. In the name of Jesus we hope and pray, Amen. Monday// Psalm 33:20// When has God helped or protected you? Tuesday// Psalm 46:10-11// God says, “Be still…” because He was, is and will be with us. What hope does it give you that God holds us all in His hands? Wednesday// Psalm 119:114// How can God’s Word give you hope? Thursday// Matthew 28:18-20// How can you help others know about Jesus before He returns? Friday// Romans 8:22-24// What would you say if you could crawl up on your Daddy God’s lap right now? Saturday// Hebrews 11:1// What does faith in Jesus mean to you? I put this book on my to-read list while reading Dani Shapiro’s Still Writing – she mentions it more than once as a stellar piece of writing. Other than Shapiro’s recommendation and having read Egan’s The Keep some years back – remembering that it was a wild ride of a different sort – I had no preconceptions and no idea that Goon Squad won the 2011 Pulitzer Prize. To begin I gave myself a quiet hour in the car during a kid-sport practice. The book is sad, depressing really, and when I hadn’t picked it up a week later I thought I might just return it to the library, especially as this is the holiday season and, truly, things can be sad enough without the addition of sad stories. But the thing is, I had thought about it several times a day during that week. The stories are haunting. Loosely connected, chronology jumping hither-thither, characters floating in and out, it reads like a series of short stories. I kept flipping back and forth to see which characters were related to which others. A dark-comedy-sans-comedy version of High Fidelity – musically-related characters winding in and out of each other’s lives, burning each other body and soul. I am grateful to have finished reading it, and grateful it’s over. Like The Keep, I think the writing will continue to spook me unexpectedly for years to come. Time is a goon, after all. I simply hope to have more hope as time passes than the characters in Egan’s books. Meatless Monday – Dessert for Breakfast! Today Teen turns 16 years old. Most every parent thinks this annually, if not oh-so-much-more often, but: HOW DID WE GET HERE? Sixteen years ago our little elf turned our world upside-down. He crawled at 6 months, walked at 10 months, ran by his first birthday, and hasn’t slowed down since. His life is all-in, full-out adventure. He has no fear. I have had to sit on my hands, close my eyes, and bite my tongue to keep from the perception that I might be squelching his exuberance. Still, he knows. I am timid and he is not and we need each other. He has taught me more about God’s goodness and creativity in this great big beautiful world than anyone I’ve ever encountered. He has thrust more animals of all shapes and sizes than I could imagine into my hands and into my heart. How could I have known that we’d have three cats, two dogs (well, one and a half, but that’s another story), three leopard geckos, a tortoise, and a snake? (and a…what?) I tell him regularly that he is one of the most amazing people I have ever met, and he knows just how truly I mean it. So today is his birthday and this all-out kid has been so low-key about this big day: sixteen! He didn’t want a party, although he went to a party over the weekend. We asked if we could take him to dinner last night and he had to think about it. When asked, he said he was excited (although he seemed a little depressed), but he did say he would’ve preferred if his birthday hadn’t been on a Monday. We made gingerbread pancakes, his traditional birthday breakfast. We surprised him with four large pizzas during lunch at school – his friends (Bible study boys, fishing, football and gym friends) had been notified in advance that they’d want to join him. In general he hasn’t been big on surprises, but we figured he’d go for this one. He did, as did his friends and plenty of high school kids we’d never laid eyes on before. And I spent most of the afternoon cooking his favorite foods: homemade sourdough croutons for Caesar salad, homemade macaroni and cheese, and orchard crumble for dessert. Not to mention the day starting, oh, yesterday, when I made the pancake batter so we could skip that step early before school. This kid loves to eat! His love language is time, and as he likes to cook almost as much as he likes to eat, I hope he knows that his mama invested a lot of time and love into preparing his favorite traditional birthday foods. Each time he asked what I was up to in the kitchen – last night, after school, this evening – he got that sweet little smirk on his upper lip, not quite a smile but a physical acknowledgment that my activity would result in his enjoyment. And it made me smile Big! 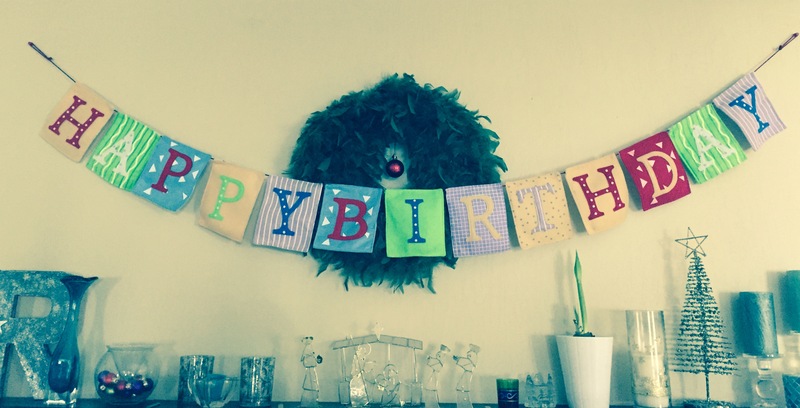 So here are two of Teen’s birthday favorites, both holiday appropriate in different ways. One of the best things about both: pancakes are a sanctioned sweet breakfast, and orchard crumble (minus the whip or ice cream) is even healthier than pancakes so… breakfast dessert and leftover-dessert for breakfast! Happy birthday to my wild child, and happy eating to all of us! Sift flour, cornmeal, baking powder, baking soda, spices, and salt into a large bowl. In a separate bowl, whisk the eggs until frothy, then whisk in sour cream, milk, applesauce, molasses, and vanilla. Make a well in dry ingredients and add liquid, whisking batter just until smooth. Set it aside for 5 minutes. Ladle 1/3 c batter per pancake onto a hot skillet or griddle and cook for about 2 minutes or until golden. Flip and cook another 1 ½ minutes. Serve immediately. Preheat oven to 375 degrees. Mix the pears, apples, cranberries, cinnamon, sugar and cornstarch together in a large bowl and toss well. Spread evenly into a pie pan. For the topping, mix the flour, rolled oats, brown sugar, and cinnamon together in a medium bowl, then cut in the margarine pieces and mix with a fork or your fingers until the mixture resembles small peas. Spread topping evenly over fruit mixture. Bake for 30-40 minutes, until browned and bubbly. Serve with ice cream or whipped topping.